Mysterious creature found on planet SR388 for which is thought to also to it's native planet. Also thought to be parasitic. An airborne life form totally capable of flight through it's almost weightlessness. This is the very base of the Metroid life cycle. Though very advanced upon birth, basic Externus Ttractus Cndaria lifecycles are still previlant. Following this partern, Metroids are not born live as with most warm blooded species but developed externally in a birthing egg. This egg is often refered to as a cocoon by many field scientists due to it's leathery, organic qualities. These eggs are laid by a central main queen in batches of up to twenty per cluster. It's tough outer hide gives it protection against the elements even in the harshest of conditions. Though very tough in their own right, they are very susceptible to extreme colds. Many xenobiologists believe that this hatred of cold by adult Metroids might actually stem from the eggs fragility in sub zero temperatures. 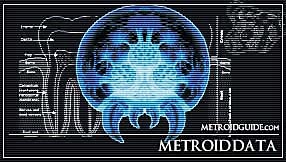 The inner membrane regulates temperature inside the egg, insuring a safe environment for the unborn Metroid. Unique leather-like texture has a special camouflage effect, therefore hiding it from anything that would be brave enough to make a feast out of the egg. 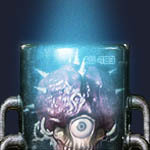 This inner membrane, although protective to the developing Metroid is not resistant to outside enviornmental influences. It has been noted that between the egg's initial incubation period of two weeks that it is the most vulnerable to changes in it's surroundings. 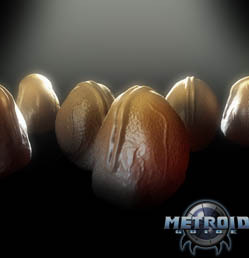 It is likely that these changes directly effect the developing Metroid's DNA sequencing, preparing it for it's enviornment before it is even born. This has given rise to the vast genetic variables of the species, all dependant of the enviornmental conditions of the egg.